I have seen how any student, from any school can rise to the occasion with just the right amount of encouragement, guidance and discipline. 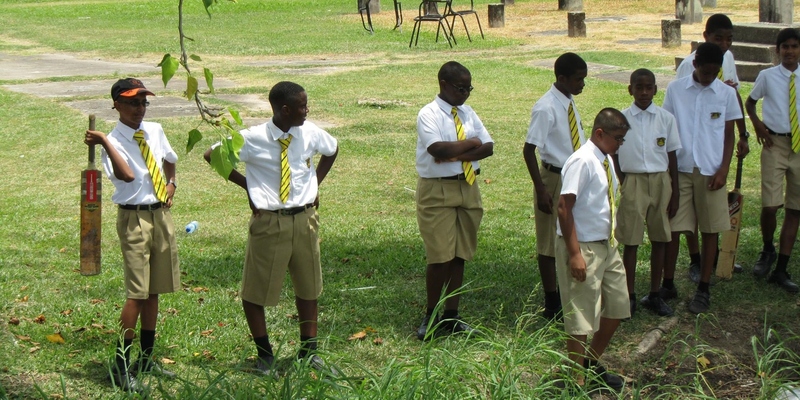 …I was given North Georgetown Secondary-there were 3 girls and 2 boys. [About the Project Competition…] I had [one of the female students] practice her presentation-gave her tips, how to stand, what to emphasize, how to speak and she soaked it all up. If I do say so myself, their presentation was fabulous. They got 2nd place and they themselves couldn’t believe it- they kept asking me “Miss we really got second, are you sure? ?” They were absolutely thrilled with their prizes of flash drives. Mentorship ties continue beyond the QCSC Student Conference. Ede Tyrell and her group over a year later. …I reunited with my group a few days ago for lunch and it was fantastic. 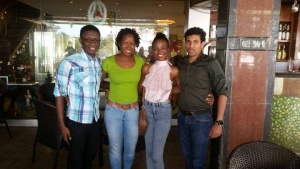 I learned that Oswald [far left] is at [Guyana Technical Institute ](GTI ) with the intention of applying to do Civil Engineering at UG in 2018, and Tyron – is doing CAPE at Bishops’ and wants to become a lawyer. 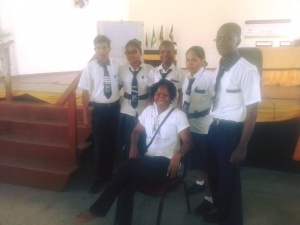 We ‘gyaffed’ about the QC Conference – and the difference it had made in all of our lives, about politics, Guyana’s future, religion, and relationships-it was a bit surreal to hear an 18 year old male lamenting that he was single because ‘this young generation of girls too speedy”.